How to Use Masterbuilt Electric smoker? 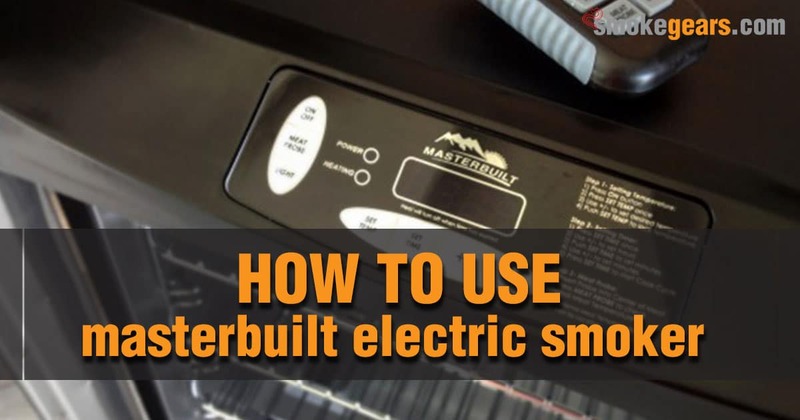 →How to Use Masterbuilt Electric smoker? Your new Masterbuilt smoker is probably one of the best electric smokers you can find on the market today. A reputable name, quality design, and functionality all built into one standing smoker, isn’t it? With this in mind, familiarizing yourself with it, finding the best smoker thermometer to use with your new smoker, and understanding the basics of smoking, will allow you to have the best experience with smoking meats. If you are new to smoking, you might be thinking about how to use a Masterbuilt electric smoker. Don’t worry, this article will take you through a few basics you should consider while you are starting out with your new smoker. It is fairly self-explanatory, but you should familiarize yourself with the type of smoker you have. Masterbuilt has several models, but they are designed similarly to a standing refrigerator (in size and height). It is vertical, so you will find it to be very safe to use and that it is easy to keep balanced in virtually any setting. It is ideal to set up your smoker in an open space for proper ventilation and air flow. Adding water to the drip pan is also a good practice. Doing this, alongside using the best wireless meat thermometer, ensures even temperatures, even internal cooking temperatures, and also helps prevent starting a fire due to grease dripping. Adding wood chips to your smoker is simple to do because it has a sliding door design. So, you won't have to open the smoker doors to add more fuel. Although it is not required, it is a good idea to pre-season your new smoker prior to actually using it to smoke meats. This will help ensure the best rich, Smokey flavor, and ensure top performance from your new smoker as well. Simply set the smoker to 275 to 300 degrees F and let it run for 3 to 4 hours. During the final 45 minutes to 1 hour, add wood chips to your tray. At the end of the 3 to 4-hour span, simply shut off your smoker and allow it to cool completely before you use it to smoke meats. When the time finally comes for you to smoke the meat of your choice, you need to preheat your smoker prior to putting anything in it. Doing this will not only help ensure even internal cooking temperature but also prevent overcooking your meat. As a new griller, one of the most common mistakes people make is putting the meat in prematurely. You want to give the smoker time to fire up and heat up before you put anything in it. Turn the smoker on to the desired temperature. This number will differ based on the type of meat you are smoking. Depending on the type of Masterbuilt smoker you've purchased, there might be a preset high temperature. You must familiarize yourself with this prior to smoking. And you should also know what the ideal internal temperature is for the specific meat you are smoking. You must also make sure that the smoke coming out of the smoker is "good smoke." This simply means that it has a slightly blue color or tone to it, and isn't just white smoke coming out of the top of your smoker. Using the built-in thermometer, alongside your wireless thermometer, gives you an extra edge while smoking meat. It allows you to ensure even cooking throughout, and the perfect internal temperatures. Preparing the meat is probably the most important step if you want to smoke some meat. Your meat should be seasoned prior to being placed in the smoker. A dry rub is best if you are applying it right before placing it in the smoker. Ideally, you should season the meat at least one night prior to smoking it, but if you are pressed for time, using a dry rub will help with flavor enhancements, and moisture retention during smoking. There is really no secret to it now. Once the preheat temperature is reached, and you are ready to put the meat in the smoker, it is truly a waiting game. You don't want to keep the smoker doors open as this will allow the temperature to decrease. You need to allow the smoker to do its job, and simply wait for the food you are smoking to reach the desired temperatures while smoking. You should check the meat every once in a while, and having a handy thermometer is the best way to do so. Keep in mind that some meats smoke faster than others. So, using a dual-temperature thermometer will also come in handy if you are using a single base temperature while smoking meats in your Masterbuilt smoker. While smoking the meat, you can add water over the drip pan every 45 minutes to 1 hour. Doing this will help with moisture retention and even cooking as well. Consider what the recipe calls for, and make sure you give it time to work if you want your smoked meats to be tasty and at the perfect consistency. Cleaning regularly your smoker after grilling. A symbolic image. It is best for you to clean out your smoker after each use. A warm water and dish-soap solution will usually do the job just fine. It is not only advised to clean the smoker after each use, but also to clean the exterior doors, racks, and internal removable parts routinely, to elongate the lifespan of your smoker. There truly is no guesswork to using a smoker. Depending on which model of the Masterbuilt series you purchase, there are a few nuances you should familiarize yourself with. For this reason, it is wise to have your manual handy and read up on the design features of your new smoker. Whether you are new to smoking in general or are just new to using the Masterbuilt series products, you won't have a hard time figuring out how to use your new smoker. These are a few basics to consider for the best results, taste, and consistency, regardless of what type of meat you will be smoking in your new smoker.